Head over to check out these LippyClip® + Keychain Wristlets ONLY $4.99 (Retail $9.99) perfect for the Easter Baskets. Now you can carry your keys in style and have your hands free, too! Select your favorite keychain and your favorite LippyClip® from the drop-down menus and enjoy mixing and matching patterns and styles. 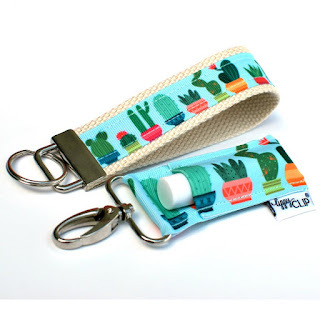 These keychain wristlets are made of soft cotton natural colored belting so it's super comfortable on your wrist yet features a cotton designer fabric of your choice on the outside. A split ring (key ring) is included and attached for you. The LippyClip® clips onto your key ring, backpack, purse, belt loop, diaper bag – anywhere you choose - and securely holds your lip balm to keeps it easily accessible to you – it won't fall out! Please note lip balm is not included and the LippyClip® is designed for standard size cylindrical lip balms such as Chapstick, Blistex, Carmex and Burt's Bees. Chapstick, Burt's Bees, Blistex and Carmex are registered trademarks and this product is not affiliated or endorsed by those trademarked products. Each keychain and LippyClip® is handmade in the USA by women working from home, and fully inspected before placing it in a pretty pink envelope and sending to your mailbox. We take great pride in the details of delivering an amazing product with stellar service, and we always take the best care of our customers. If it gets dirty, spot clean is recommended. This is an original Gabriel's Good Tidings® product. We fiercely and proactively protect all of our product designs and trademarks. $2.99 for the first item and $0.25 for each additional item. US only. Ships no later than Sat, Mar 3.